Graphene – the lightest, strongest, most flexible material ever made – could revolutionize our way of living, which is why now is the time for investing in graphene. The graphene industry is expected to have 40% annual growth over the next seven years, going from the $9 million industry it is today to a $126 million market, reports Lux Research, an independent research firm focused on emerging technologies. We at Money Morning saw graphene's potential early. "Stronger than steel and lighter than a feather, this high-tech medium will shape virtually every part of our daily lives by the end of this decade," Money Morning Defense and Technology Specialist Michael Robinson wrote in December 2011. And with these new developments, graphene is certainly on its way to changing the products we use every day – which is why more people are asking about investing in graphene. Carbon-based graphene was initially discovered in the 1960s but rediscovered by two scientists, Andre Geim and Konstantin Novoselov, in 2004. They first created microscopic flakes, then changed the flakes into extremely thin sheets. The two scientists won the Nobel Prize for Physics for their work with graphene. 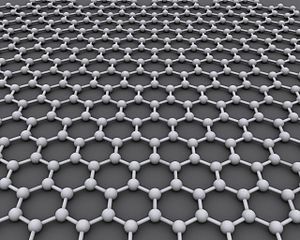 Graphene is just one atom thick and occurs in a hexagonal pattern, kind of like chicken wire. Since it's carbon-based, as are all life forms on Earth, graphene can enter the body without disturbing the immune system and without causing harm to body tissue, as silicon and plastics can. Researchers at the U.S. Air Force Research Laboratory say graphene could be used to grow human tissue. The implications are huge: Lab-grown human hearts that can last, disease-free, for 100 years may one day help children with birth defects and adults with heart disease. A scientist at Wayne State University is trying to combat Alzheimer's by inserting graphene electrodes into a patient's brain. Currently, similar devices last only a few months, but the graphene implant might last as long as five years, greatly improving the quality of life for Alzheimer's patients. Graphene will also be used to make synthetic blood, which would greatly reduce the chances of using infected blood and allow those with rare blood types to receive better care. And according to Robinson, graphene will allow doctors to use high doses of new drugs that are lethal to cancer cells – without getting a patient sick or harming healthy cells. In addition to its healthcare applications, graphene has many other potential uses. Researchers have developed a graphene transistor that would compute at much faster speeds than today's devices as well as a graphene antenna that could make wireless speed 100 times faster. Because graphene is able to convert a single photon that it absorbs into multiple electrons, whereas most materials generate one electron per photon absorbed, it could possibly create solar cells in which every photon falling on graphene is converted into an electric current. This would allow solar panels to absorb more light and increase the efficiency of solar energy. Graphene is also amazingly good at absorbing radioactive waste. This will improve clean-up after nuclear accidents and at mining and natural gas drilling sites where natural contaminants often spill into nearby water supplies and land. Graphene could also lead to longer-lasting, faster-charging batteries; much lighter, more fuel-efficient cars; and even lightning-powered skyscrapers that would be made of graphene that would harness the energy from a lightning bolt striking the building. Graphene ink, created in 2009 by Jessup, MD-based Vorbeck, became the first commercialized graphene product. With the company's technology, graphene can be converted into wearable computers, sensors, flexible-touch screens and paper that conducts electricity. And all these applications are created with the help of a modified ink-jet printer. More commercial graphene products are expected to appear in 2013 or 2014, and companies have rushed to get graphene-related patents, which now total more than 7,000. Chinese entities lead in patents with 2,204, U.S. entities are in second with 1,754 and South Korean entities are third with 1,160. Among companies, Samsung Electronics Co. Ltd. has the most graphene-related patents, with 407, and International Business Machines Corp. (NYSE: IBM) is second, with 134. However, those two companies are not the best ways to invest in graphene. Money Morning Executive Editor William Patalon III recently outlined the best ways for investing in graphene now. Check out these hot profit opportunities.